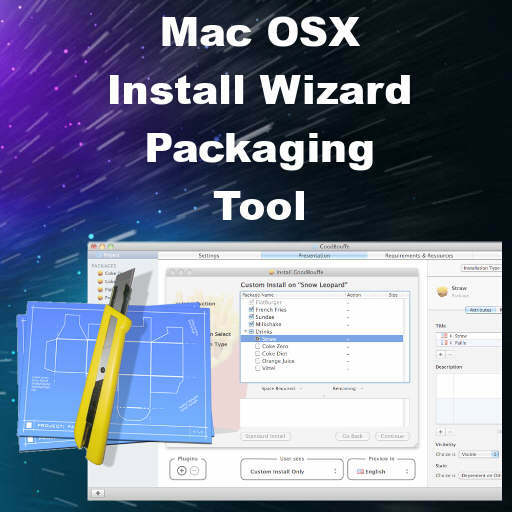 Developer Stephane Sudre has an install wizard packaging tool available for Mac OSX called Packages. On Windows you can use InnoSetup for this but if you are building cross platform apps with Delphi 10 Seattle you probably need a way to deploy your app to Mac OSX. Packages seems to be a really good solution for this. It works similar to other install wizard tools where you add the files you want to deploy to a list of install locations (like the Applications folder on the Mac). Keep in mind that if you install to the Applications folder you may have to store any settings files that you create in the users directory and not in ExtractFilePath(ParamStr(0)). It has all kinds of options for configuring permissions, custom scripts, dependencies, and more. You can customize the installer look and feel in addition to adding a license section to the install. Once you build your Package you end up with a PKG file which is able to be run like an executable on Mac OSX. PKG files are also signable. It seems like this method may be better than creating a DMG (disk image) file for distribution to the Mac. Source code is also available under a BSD license and it compiles under XCode. You should be able to use this installer for Mac OSX apps you create with Delphi Seattle, Appmethod, and C++Builder. Head over and download the free Packages installer wizard for use with Delphi 10 Seattle apps on Mac OSX.